Saturday morning, 13-Jan-2017, an emergency alert went out to Hawaii’s alert-enabled mobile phones that a missile was inbound. Discussion ensued about how this mistake was made and what we could do about it. 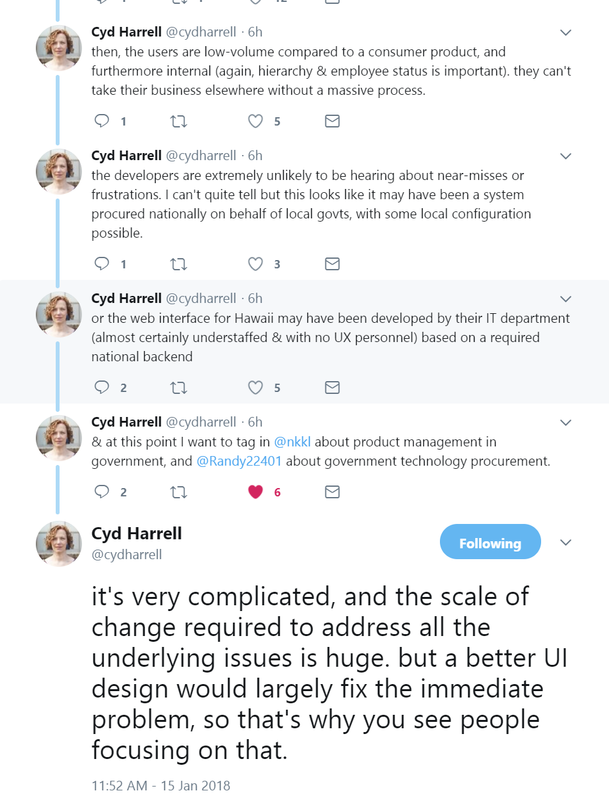 Cyd Harrell, who has experience with government software and processes, tweeted a thread about the complexity of both how and what can be done. The news story made me think about our human tendency to want to explain things simply, state a theory, and set off in a certain direction based on that theory–as quickly as possible. I was listening the the Radiolab podcast episode about stereotype threats, and the replication crisis (in psychology). In particular, an experiment was formerly replicated to show that college women’s math test scores increased to equal men’s when they were told that the particular test they were given had never shown any unequal gender results. There were other variations on the experiment, but they were having trouble replicating it. They were wondering if it was because stereotypes change over time, this generation is more aware and able to block the power of stereotypes, or if the level of the preparation for difficult math tests was different, etc. I kept wondering: why not ask the participants what went through their minds during the test? Why is this component, hearing from the actual participants, not included in their research? Probably because of academic methods. Possibly because the answers different participants would give would each be different. Those differences would be difficult to summarize into a simple explanation. This reluctance to embrace complexity exists in the business world. In the tech space. We’re trying to support simple versions of people and scenarios that just don’t exist in any clean way. We want to reduce cognition to heuristics and pattern processing. People in tech see little difference between training a pilot to fly a plane and writing software to control a car on a road full of other cars driven by other people. I believe there is more complexity involved, specifically involving time, lived experience, continuous consideration of inputs, and emotion. People change over time. It’s not simple rationality. They change their minds. They get influenced by others and shift perspectives. Within the industry of making algorithms, this is not viewed as a good thing. You can’t be pinned down. It’s harder to chase you and get your attention and appease you. Simplicity and minimalism, these are the watchwords. But humans are complex. The algorithms we interact with are no match for the speed of our thinking, the cultural references, jokes, and digs we make, the leaps of intuition we have, the motivations and guiding principles we follow, the empathy we feel, or the compassion and kindness we display. Continuing in the vein of “simple” has brought us to a wall. The best way I can think of to address our fear of complexity is to accept it and start investigating pieces of it, little by little. Pick a particular thing a person is trying to do, a set of contexts, and a couple of different thinking styles. Gather from people what goes through their minds as they seek to accomplish this purpose, translate, and look for patterns. The “translate” part is where you put into words the crazy-human-ness of our inner voices. When a person tells you of an event that happened when she was a teenage lifeguard at a pool, you listen. A group of boys had jumped in the deep end, and one of them was struggling to stay afloat. She had to decide whether he needed rescuing or if he was “fake drowning” to catch her attention. She wondered if he actually couldn’t swim and jumped into the deep end just to keep up appearances with his friends. “Of course I’d jump in the deep end if I didn’t know how to swim!” You have to recognize sarcasm and take into account context and mood. How do you do this unless you have a human brain equipped with life and social experience and capable of cognitive empathy? So our job is to help those around us embrace the complexity and feel confident in exploring it, rather than racing past it with a hasty theory. We don’t want our own crisis, do we? Indi has office hours! If you have a question, you can book time with me in one of three ways. Use the time however you need. I set up availability for connecting from all the time zones. A new “commercial” website is on its way, aimed at managers and those whom you wish to persuade of the value of problem space knowledge. It will contain case studies from the interviews I’m conducting with people who have made use of mental model diagrams, thinking-style segments, and opportunity maps. Take advantage of the wealth of available content, and feel free to pass along links to those you are mentoring. Q: (from Bobby Gonzalez 21-Dec-2016) Thank you Indi. Interesting article. Googled a bit and found some research indicates people with prosopagnosia have diminished capacity for empathy for others. Also, psychophysiological responses to empathy recruit a region between the inferior temporal (important for perspective taking), and fusiform gyrus (imperative for facial recognition). Maybe “seeing a face” does activate parts of the nervous system that vitalize or enhance ones ability to empathize? Q: Lauren Faggella 19-Apr-2017 Would you agree that some people respond differently in person than over the phone? For example, I don’t always like talking over the phone, particularly to people I don’t know very well. But if I sit down with someone and get to know them for the first time, I’m likely to open up and speak on things that I wouldn’t ordinarily touch upon. A: It depends. (The classic answer!) First, your own preferences are not evidence of anything, so the thought of your preference acts as a red flag to re-ask yourself about what might work best for a particular participant. Second, during a listening session you use emotional empathy to establish rapport and generate a comfortable atmosphere for the participant to tell you their inner reasoning. You aren’t doing any perspective-taking during the listening session–that’s for later, when you’re using artifacts from the data to work on your ideas and solutions. During the listening session, you’re in the problem space, not thinking about solutions nor ideas, and not thinking about synthesizing or analyzing what you hear. You do want to help participants trust you during the listening session, and you can do that in any way that feels right to the participant. If you are making the participant feel supported and comfortable, you shouldn’t get different results whether you’re on the phone or person, unless the comfort depends on visual cues as well as spoken word. Third, I emphasize phone to motivate teams who don’t have the resources to get out to see participants. I want them to still gather this knowledge. I want everyone to be able to conduct listening sessions. Taking travel out of the equation helps in many cases. Fourth, if you are doing solution space research, watching and interviewing a participant making use of a particular solution, then perspective-taking, cognitive empathy, does come into play. This is a different sphere than listening sessions, which are (usually) part of the problem space. It always depends. Make your decisions based on your participants.